Belfast Bladeworks 2017: A fairly detailed review! This weekend saw the third leg of the IHFL, the Belfast Bladeworks 2017. The event was a success for the organisers and there was some excellent fencing too. I didn’t get on quite as well as I had hoped but still enjoyed myself immensely. Here’s my look at this great event. For some reason, the ins and outs of my bouts are still clear in my mind so I’m going to go into a bit more detail than usual. The Skainos Centre in East Belfast in a decent sized modern venue for a HEMA event. There’s a cafe right next door and good parking opportunities. The hall we got to use was big enough to accommodate a seven by seven-meter ring for the bouts. A big space isn’t absolutely vital for longsword fencing after all the fighters will have to come into distance at some point. However, it was appreciated and a bit more space does allow for more variety in approach. It prevents the ‘sports fencing’ linear style and makes the bouts last longer (or so it seems). The floor was some sort of slightly springy vinyl type dealio (I am no expert here) which we were warned not to hit too often with uncontrolled swings. In fact, such lack of control would be penalised in the scoring system. There were a few warnings but as far as I remember few actually lost points this way. The floor wasn’t as conducive to fencing as a sprung sports hall type of floor, my calves and ankles seem to have taken more of a battering than I usually experience but that might just be me. The MCG are always extremely well organised and professional in their events. Clearly laid out pools and plenty of assistant judges to help out with the distribution of armbands meant that everything proceeded with the absolute minimum of delay. I think I have the only red fencing jacket in the Irish HEMA scene so I am almost always red for the whole of the pools stage of most competitions, but that doesn’t mean that I can’t appreciate a seamless tagging process when I see one. 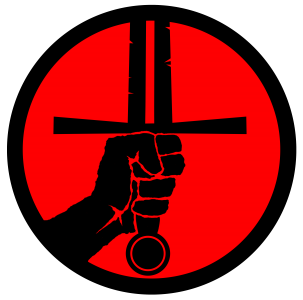 The best I have ever seen was the Leitrim Longsword’s ‘Fool’s Fayre’ event where the innovation of elasticated armbands changed all our lives for the better. The kit checks were also great and included an actual set of weights and ruler to measure blade flex; none of your arbitrary press the tip into the ground ’til it bends and murmur “sure, that’s grand” here. This was science! Everyone passed the bendy-flexy test and the tournament rolled on as planned. I am making light of the safety aspects but it was really an impeccably run event where nobody was left in any doubt that the MCG lads and lasses were really committed to delivering a quality day. There were sixteen fencers making two pools of five and one pool of six fighters. I was in one of the smaller pools meaning I got four bouts. The pools were all mixed together in the running order meaning nobody was waiting too long between fights. Progression to the eliminations was automatic for the highest scorer in each pool and then the next five highest across all the three pools progressed to make up eight for the eliminations. Points scored and not bouts won was the focus as has become pretty standard across the IHFL by this stage. I had a few team members with me again Jiri and Tomasz. It was really good to have a bit of support around me and to offer the same in return. We all got to have a ‘corner’ to whisper sage advice in our ears and point out what we might be missing in the heat of the moment. I’ll come back to my team-mates later on. I fought against Piotr from Leitrim Longswords, then Katja from MCG, Adam from Dublin HEMA and finally Michael from the Cork Blademasters. Piotr and I have fought a few times before and his varied and aggressive style is always a lot of fun, yet challenging to overcome. I managed to land a couple of ‘deep’ hits giving me the win even though the scoreline was close. Against Katja I managed to exploit a few little errors in her guards to score some quality hits, including a really satisfying thrust, gaining me a large lead. I gave her feedback after the fight because, seriously, if she had held that Pflug a bit better I may not have won and certainly not by anywhere near the margin I managed. Me trying something a little different. My next bout of the stage, like my opponent, loomed large in my mind. Michael is a big guy, he has long arms a longsword and frustratingly enough, the speed and reactions to make use of them. I had been working on my approach at last week’s training sessions, but that was all too new and unfamiliar to actually bring to the fight. I planned to do all kinds of tricksy feints followed by spring-stepped Zwerchs to his weak side but in the final analysis, I didn’t even try. What I had practised a couple of times was just too far outside my normal style to have sunk in properly. I went for the much simpler, wholly ineffectual, approach of rushing into distance and getting hit by him. Excellent! My last bout of the stage was against Adam who is a relatively new face in the IHFL, although I did face him in the Feile na Gaiscgh last month. He was tricky to land clean blows on and he was leading our bout until the penultimate exchange. Right at the start of that exchange though, he adopted a slightly awkward looking crossed armed low guard. I was already in motion toward him and I could tell that he didn’t have time to threaten me before I closed with him, and again I managed to land a solid thrust and went ahead. I managed to secure advancement to the elimination stage as did Jiri. I got to face Michael again (yay…). Our second encounter went much better for me. I played to my own strengths more and managed to land solid, clean hits to his arms/hands; putting my in the lead for some of the bout. When I tried to mix it up with a sweeping one-handed attack to the legs I missed and my thrusts were nowhere near as effective as they had been against other opponents. On one particular exchange, my thrust landed well but so did his and nobody scored points. At this stage, I should have gone back to making hits to shallow targets and getting away clean as I had done at the beginning of the bout. After all, the score wasn’t important now, winning was the goal. Instead, I tried to make the failed thrust from the last exchange work, it didn’t. Michael simply displaced it and landed a solid six-point blow to the top of my head giving him the lead which he maintained until the end. I was eliminated. My goals for the event had been to qualify (success) and beat Michael (not success). So not all bad but plenty of room for improvement. I really learnt the importance of patience and to avoid playing to my opponent’s strengths; even if I am not always able to capitalise on my own I should at least not give the game away by making it easy on them. Jiri took his elimination a bit further and ended up placing fourth after losing the battle for bronze to Adrian Schwapka from Leitrim. His fights seemed to go well once he had started to move around a bit more, entering and leaving distance to wrong-foot his opponents and make the most of his natural reach. Michael went on to win the tournament overall. I have made a habit of losing to the eventual winner and it isn’t one I would like to keep! All credit to the organisers and of course to Michael Nolan (Gold), Andrej (Silver) and Adrian (Bronze). Well deserved victories to them all! That’s my look at this leg of the IHFL, the next and final leg is in Galway sometime in October and I’ll be reviewing that once it’s done. As I mentioned elsewhere I have recently joined the ranks of the employed and have been a bit distracted from HEMA as I settle into my new situation. Apologies for missing the odd weekly instalment but as soon as I’m more settled I’ll get back in the flow of consistency. As always I hope you have enjoyed this post; if you have then please do share it around with anyone you think might like it too. If you want to get in touch with me you can use the comments section or the Wrathful Peasants Facebook page. Previous Post Focus: Getting it and Keeping it. Next Post Talking about Swords and a few thoughts on Armoured Fighting.